Chisel Mod 1.13/1.12.2/1.11.2 – A builder’s best friend. Bookshelves -- Chisel adds several Bookshelves, available in all 6 wood types. They are even usable with the Enchantment Table. Chisels And Bits Compatibility -- Chisel is compatible with Chisels and Bits, no big surprise! 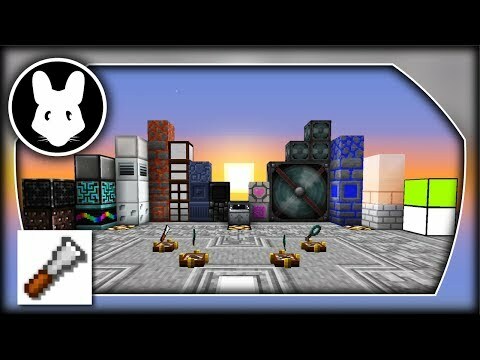 Experience an explosion of possibilities when these two mods are paired together in a mod pack. Beautiful Prismarine -- Many blockgroups in Chisel are designed with uniformity in mind, there is no chaos and no block is meant to be left out of building! Jellybeans -- We ensure that no blocks are ever 100% duplicates. If that ever happens, we make sure they're given enough difference in color and feel, to gear players' creativity. Bookshelves -- Enchanting Tables work with Chiseled Bookshelves — Yes, all types of Chisel's Bookshelves of different types and colors! This is a simple tutorial that will helps you to install Chisel Mod for Minecraft 1.13, 1.12.2 and others version successfully! Download the Chisel Mod below or from anywhere, make sure the mod is compatible with the version of Forge installed. Place Chisel into your Mods folder. If you don’t have one, create it now. Chisel is created by tterrag1098, the mod was created on Aug 22, 2015 and the last update took place on Feb 27, 2018, so far is a total of 20,669,078 downloads. If you are interested in more information about Chisel Mod, please go to CurseForge[link]. The Chisel Mod download links from below are available for Minecraft's most popular versions so far, for others version (likes as 1.12.1 / 1.11.1 / 1.10.1 / 1.9.2 / 1.8.8 / 1.8.4 / 1.7.2 / 1.6.4 / 1.6.2 / 1.5.2 / 1.4.7) please visit the official website above! We do not host any Chisel files on our website. We do not modify or edit the Chisel in any way. If you have any problem with Chisel Mod, please leave a comment below and we will help you as soon we can.